Play Mission: MRD, and you can't help but learn important science. Taking games and applying them to real-life goals and tasks, something known as “gamification,” is moving forward at warp speed thanks to our digital-mobile world. Gamification has made inroads in a wide variety of areas including self-improvement games, games to encourage positive lifestyle changes, and even games to increase motivation to complete work objectives. Genentech, a leading biopharmaceutical company, is now gamifying the science behind cancer therapy—and they're not alone. But how is gamification relevant to cancer patients? Well, for a patient with cancer, trying to plan for the future can be overwhelming. The scientific jargon, technical terms, abbreviations, and acronyms do not help matters. Survival times, for instance, can be measured in very different ways, and so can a cancer patient’s response to treatment. That’s where Mission: MRD fits in. 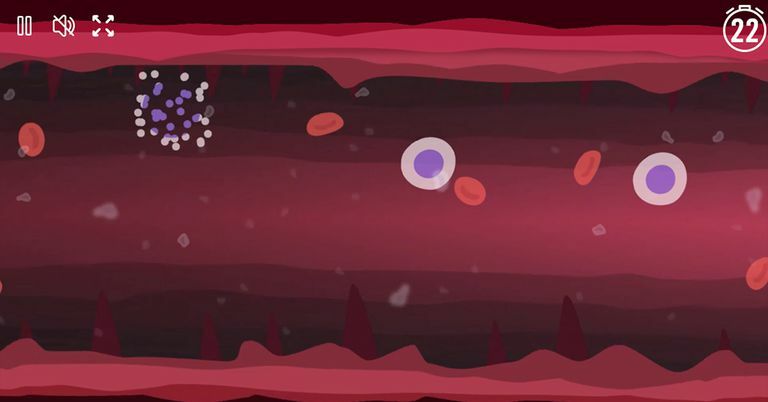 Genentech has created a new 60-second mobile game, Mission: MRD, to teach people about minimal residual disease (MRD)—a way of measuring a person’s response to a given cancer therapy or regimen. In Mission: MRD, a user travels through the bloodstream, destroying as many cancer cells as they can with the goal of reaching MRD-negativity. It is important to note that this game is primarily for entertainment and not intended to be medically or scientifically accurate, but rather to raise awareness of MRD status. There are a number of ways to measure disease burden in cancer. The MRD-negative status in CLL is made possible with newer, highly sensitive technologies. When someone with CLL reaches MRD-negativity, it means no cancer can be detected in blood or bone marrow samples using specific tests that use more sensitive methods than old ways of counting cells per 100 under the microscope. MRD-negativity may be associated with better outcomes. More work needs to be done but a growing body of evidence suggests that MRD-negativity after certain treatments may predict a longer remission and possibly longer survival times for a number of blood cancers. Other games are planned and a variety of images and descriptions are available on the Genentech website to help you understand the cancer immunity cycle — the process that leads to the development of an immune defense against cancer cells. Smolej L, Šimkovič M. Practical approach to management of chronic lymphocytic leukemia. Archives of Medical Science : AMS. 2016;12(2):448-456. Hallek M, Cheson BD, Catovsky D, et al. Guidelines for the diagnosis and treatment of chronic lymphocytic leukemia: a report from the International Workshop on Chronic Lymphocytic Leukemia updating the National Cancer Institute-Working Group 1996 guidelines. Blood. 2008;111:5446–56. Hallek M, Fischer K, Fingerle-Rowson G, et al. Addition of rituximab to fludarabine and cyclophosphamide in patients with chronic lymphocytic leukaemia: a randomised, open-label, phase 3 trial. Lancet. 2010;376:1164–74. Bottcher S, Ritgen M, Fischer K, et al. Minimal residual disease quantification is an independent predictor of progression-free and overall survival in chronic lymphocytic leukemia: a multivariate analysis from the randomized GCLLSG CLL8 trial. J Clin Oncol. 2012;30:980–8.